1. Miss Universe third runner-up Shamcey Supsup went around Metro Manila on the second day upon her arrival in Manila. The motorcade, organized by the Makati City government, started from the Araneta Center in Cubao, Quezon City, and proceeded to the Quezon City Hall, the University of the Philippines campus, the Cainta municipal hall, the Makati High School and the Makati Fire Station, from where she headed back to the Araneta Center. Proud fellow Filipinos mobbed the streets wanting to see the tsunami walk of the beauty queen in her bikini. It was such a disappointment to most men. 2. 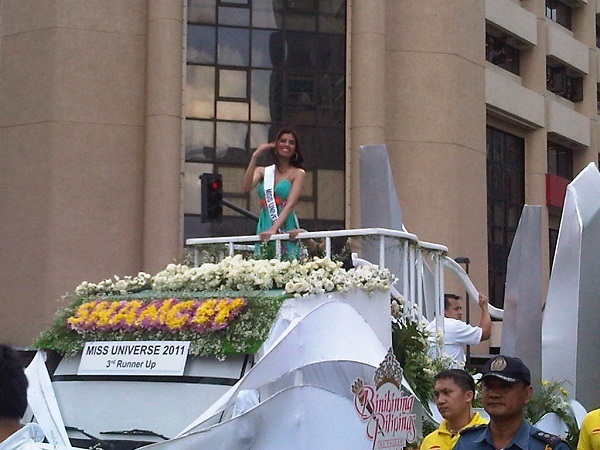 Miss Universe 2011 third runner-up Shamcey Supsup blew kiss after kiss to the crowd during the float motorcade in response to the warm welcome of fellow kababayans along Ayala Avenue in Makati City. Among those who caught the kiss blown by the beauty queen were construction workers. Suwerte! Flying kiss lang naman! 3. Supsup arrived at her former school (Makati High School) on board a black Audi sedan. DOM’s in number are updating their resumes. They’re to bid for better sedan’s, SUV’s, AUV’s and even sports cars. And most of all, the catch is they’re willing to love Shamcey’s deity. 4. Makati City Mayor Jejomar Erwin Binay Jr. was also at the high school during the beauty queen’s visit. Like his father it's an early campaign for the next elections. Just taking advantage of the opportunities. Good job. Start with your own land. 5. Supsup’s batchmate and friend during high school, congratulated the beauty queen and wished her good luck in her future endeavors. Friends of the beauty queen are getting bigger in number. A manifestation of a Filipino trait. Let’s hope that her friends won’t abandon her in times of trial. 6. “Extremely happy,” were the words heard from Supsup after she stepped off the float from a motorcade along Ayala Avenue in Makati City and transferred to another car for another parade somewhere else in Metropolis. But deep inside the beauty queen was extremely tired for a day long activity. Aminin!